so! my triumph gt6 historic race car suffered through a complete engine rebuild over the winter (it was a nightmare in there) and is ready to go vintage racing this summer (1900 lbs! 160 hp! toyota transmission! modern cv rear suspension!). my plan is to build my boxster into a nasa st car to race st3 summer 2020 and put the vintage car out to pasture. my boxster will hopefully have the 3.6 engine in it by this time. the 3.6 without breathing on it (ie, using what dynos results that i could find for the stock 3.6) puts out about 285 average hp as per nasa calculator. i'll have the z-top which is give me a non-oem roofline. i've decided to go tires over aero, so 285 slicks on the back and base trim model aero. that makes for a 2800 lb car + my fat arse (and radio, and cool shirt, etc.). seems about right to me; car corner balanced at 2950 last year and, while the carpets etc., will be coming out, there will be a cage going in, and i'll keep the pssgr seat, windows, etc, accusump and the extra oil, and can add a fire system if a few more lbs is reqd. sound about right? tires before aero? and, if the engine dynos higher or the car weights in lower, i can either (a) add more weight (nasa allows up to 250 lbs ballast) or (b) move to a dot tire like an a7/r7. what would you do - heavier or less tire? What tracks will you be running at? If they are higher speed tracks where aero is important, then go with aero over tires. Otherwise, go tires over aero. BTW, truly effective aero is a lot more difficult to achieve than you might guess. well, ever since elon borrowed my wind tunnel for something or other (space force? space x? can't remember) i've had to do what every other non-factory racer does with aero - copy, experiment, monitor track times. so, aero for me is higher trim level front bumper cover and skirts (use factory aero design) and a rear spoiler. since my z-top gives me a very cayman roofline, probably just copy the factory again with a joe toth ducktail and a gt4 rear wing. add a gt3 front splitter and something for the rear - diffuser to manage airflow under the car and some vents to address the drag chute that is the rear bumper cover. however, i can avoid all that by keeping btm aero and going to wider, stickier tires. not sure i agree with aero being more important on high speed tracks; aero can add drag when downforce is not needed (ie, fast straights) and, while our local track is slow-ish and technical, tt guys are taking off seconds with good aero. but i still am thinking tires first; see how i do in st3 and add aero/hp/ lightness in a few years and move to st2 - keeps the $ inputs incremental. Last edited by The Radium King; 03-22-2019 at 07:26 AM. Reason: added hp! I have a 2005 3.6 which is stock, with the exception of the airbox (k&n cone filter), headers and no cats and 3" borla race mufflers. 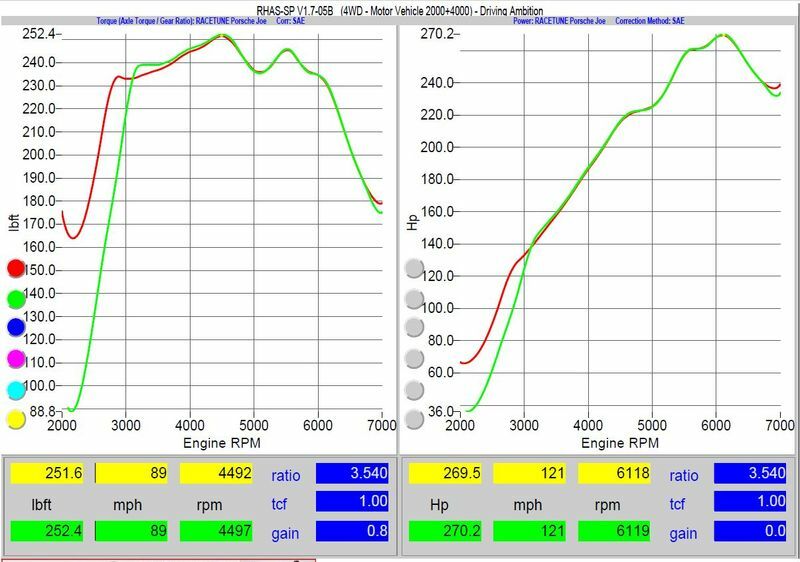 I'm running a Motec system and was recently dyno tuned on what he called a conservative tune at 270 whp. Car weighs in at about 2530lbs (haven't weighed it recently). I run 245/40 and 275/40 tires or 250/650 280/680 slicks. I've got aero front and rear, GT3 style front "splitter" - Toth Canards and a rear wing. Last edited by rastta; 03-22-2019 at 09:09 AM. In my non expert opinion tight technical tracks (look at speeds in corners vs perceived aero effectiveness) will mean superior contact patch and control there of will yield more value than aero guess work. Get a good set up for some beefy sticky tires.....again just an opinion. You have to ask how many high speed sweepers will I have? Are you tuning the factory DME or have another system? Motec M800 ecu runs everything.